On the 4th and 5th I just did a bit of birding at Lytchett Bay. The weather was mainly cool and grey and there were only a few migrants about, a Greenshank was probably the best bird, although a male Redstart was seen on the 5th by Paul Morton. A cool and grey day at Lytchett. With a couple of good birds in eastern Devon, Margaret and I headed there on Good Friday. 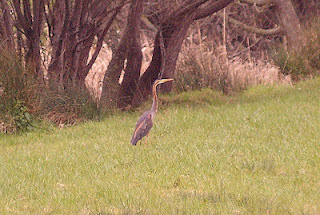 First we drove to Budleigh Salterton as a Purple Heron had been seen near the River Otter for the last couple of days. It was pretty cold but gloriously clear but no amount of searching could reveal the heron so we assumed it had gone. The River Otter at Budleigh Salterton. We then drove on to Teignmouth but as we were going to be driving close to Exminster, it seemed sensible to try to see Cirl Buntings on route. I had tried at the same spot in January without success but they may have been wintering elsewhere It took about 20 minutes of searching to find a male, which conveniently briefly sang before it flew. A male Cirl Bunting photographed in the same area last June. With at least one year tick under the belt, Little Haldon golf course near Teignmouth was our next destination. We arrived to hear that the Hoopoe had been showing well but now there were many golfers on the course and it had become very flighty. Stopping for the Cirl didn’t seem like such a good idea now. It took a while but then we saw it in a gap in the vegetation on the edge of the course, just time for a couple of photos before it flew. ... and then it was off ! A short break for lunch at Teignmouth was hindered by the masses of grockles along the seafront, what this place must be like in August! ... and the estuary was busy too. Pied Flycatcher is a scarce but regular migrant in coastal Dorset, but I often miss them in spring when the males are in their breeding finery and end up searching for drab autumn birds. Breeding is confined to the Sessile Oak woods of western Britain and there was one such wood just 12 miles away. As it was still early April and to the best of my knowledge only a single migrant had been seen in Dorset this year, so my expectations were low. However we soon found a singing male by the hide. A breeding plumaged male Pied Flycatcher is a sight to behold. Wintering in tropical west Africa and breeding in western UK, this species has benefited from nest box schemes. Back near the car park there was two pairs of Mandarins and a Wood Duck on a woodland pool. Mandarins were first introduced to the UK in the early 20th century and is slowly spreading from its stronghold around London. Wood Duck occupies the same niche in eastern North America and although it has been released in the UK it not established a self-sustaining population. There has been speculation that wild might birds might reach us from the USA, following records in the Azores and Iceland. The amazing 'sails' on a drake Mandarin are modified tertial feathers. We were just about to leave for home when I discovered that the Purple Heron had been see, It hadn’t gone after all! We quickly returned, as I approached some birders pointed out where it was, only to add ‘ its just gone into the ditch’. I had missed it by two seconds! After ninety minutes of waiting it appeared on the far side of the wooded ditch for just a few seconds, only myself and another birder saw it and all the rest, including Margaret who were on the other side, dipped. ... but it choose the ditch to the south where it fed out of sight. Photo of the same bird from the Internet. Two vagrants, a scarce resident and a localised summer visitor plus a couple of introduced ducks, not bad for a day in Devon. Q so where does this heron come from? A probably it was flying from tropical Africa to Spain and it overshot and landed here. Q So it like a normal heron, I mean is it smaller? A no it’s not really smaller but it is a lot slenderer. Q Is that because its flown such a long way?